The prizes in physics, life sciences and mathematics went to six men and three women, including four researchers who shared two prizes and five who get the full reward to themselves. Vincent Lafforgue, of France's National Center of Scientific Research (CNRS), was awarded the prize in mathematics for groundbreaking work in multiple areas. Five US-based researchers who won prizes in the life sciences included Frank Bennett and Adrian Krainer, from companies in Carlsbad, California and Long Island. They were recognized for their discovery of a DNA-linked process that led to a treatment for a rare infantile disorder, spinal amyotrophy. They were joined by Chinese-born scientists Xiaowei Zhuang (Harvard), who developed a new tool for super-resolution molecular imagery, and Zhijian "James" Chen (University of Texas), for his discovery of a DNA-sensing enzyme that could be associated with auto-immune disorders. The US-based contingent was completed by Angelika Amon, an Austrian researcher at MIT, for determining the consequences of aneuploidy, when cell does not have the normal number of chromosomes. The physics prizes went to Charles Kane and Eugene Mele (University of Pennsylvania) and Jocelyn Bell Burnell (Oxford). Six $100,000 awards were given to 12 researchers for promising early career work. The "Breakthrough Prize" is only six years old but it is far more lavish than the coveted Nobel, which comes with prize money of around $1 million and is often shared by two or three laureates. The prizes will be presented at a star-studded red carpet ceremony in November, hosted at a NASA research center in Silicon Valley by actor Pierce Brosnan. The mathematics prize propels 44-year-old Lafforgue into a celebrity world which has not typically been part of his day-to-day work, he acknowledged. "I'm game," he told AFP before the official announcement. "It's American culture." He recalled that Yuri Milner, a physician and internet pioneer who became a prominent Silicon Valley investor, created the prize in 2012 to make scientists stars, hoping to repopularize the basic sciences and generate public support. 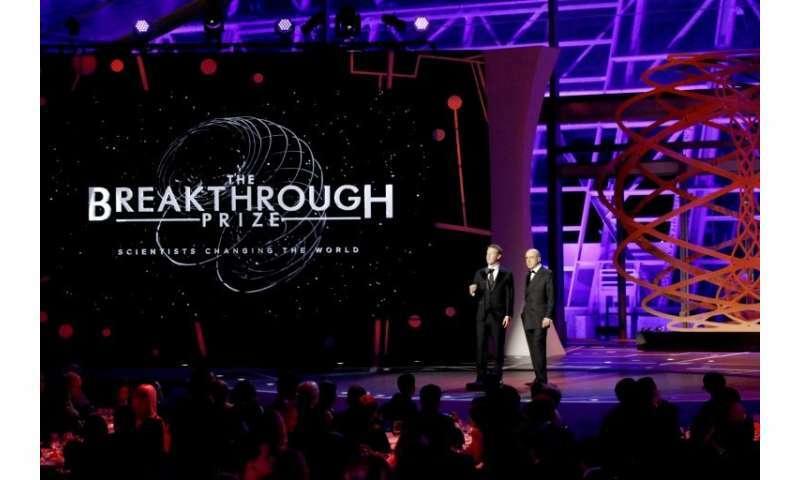 "Breakthrough Prize" patrons include Facebook founder Mark Zuckerberg, Google co-founder Sergey Brin and Ma Huateng, founder and CEO of Chinese internet giant Tencent. Unlike the Nobel, which often goes to retirees, the "Breakthrough Prize" seeks to recognize recent discoveries, and not necessarily concrete applications of their work. "One does math for its beauty, not for its applications," said Lafforgue, while stressing that there are applications of his work in the field of cryptography.